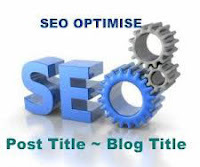 Title tags for blog is very important in Search Engine Optimization. Here I am going to give you an important SEO tip to get more search engine attraction. In Blogspot blog, the title tag is not search engine friendly. If you change the title tag of blogger blog, you blog post title will get more attraction. Let me first tell you, when you search anything in Google you may see the titles in two ways. Here, you can see post title is linked with blog title. Hope you can easily change the title tag of your blog. Please don't forget to put a comment if the post helps you. This entry was posted on Saturday, March 9, 2013 at 8:18 AM and is filed under SEO Tutorials. You can follow any responses to this entry through the RSS 2.0. You can leave a response.